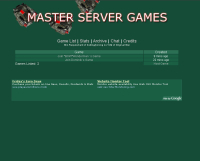 Master Server is a system, introduced to OW with patch 1.09, that enables people to host their own games through http://master.owsupport.com/ website (those created using Multiplayer section in game menu are listed as well), and joining them through that page (or game). To join a game click its name in Game column. Created column shows us how long ago the game was created. Note: It works only with version 1.09 or later. 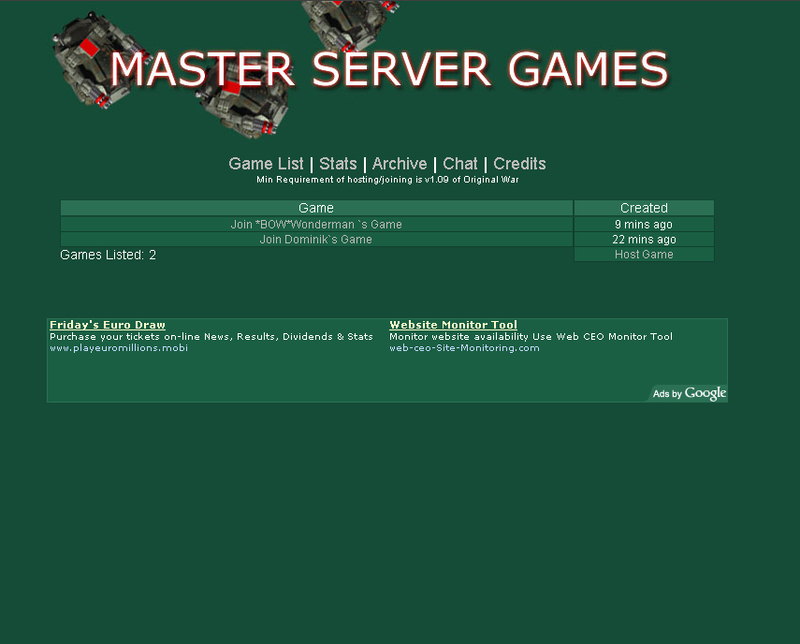 If you are not interested in joining a game and want to create your own, then click Host Game under Created column. You can achieve the same goal by selecting Multiplayer in game menu and clicking Create game. In case you don't want more people to join your game, select Lock game. In version 1.10 of game you can use new run parameter to prevent OW from listing Master Server games. To achieve this create a shortcut to the game and add NoListing to the path (i.e. "Z:\Games\Original War\Owar.exe" NoListing). Note: If you have problem hosting your games (other people can't join you), you should check your router and/or firewall. They may have blocked necessary ports. To fix this open port 27963 UDP and, if you use GameSpy Arcade, additionally 15213 TCP. Master Server records game statistics. Click Stats on its website to see them. Statistics archive from past days is also available. Just click Archive. The last available feature is Chat which you can use to chat before the game. It is connected to the same room as the one in game.